Right from the start of the month I knew I wanted to do a little statue at some point. But I've never done any three dimensional making so wasn't sure what to use. 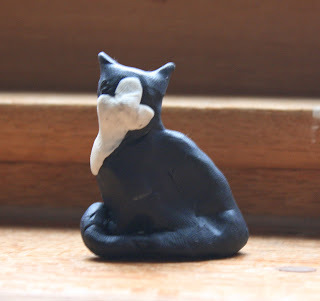 Initially I thought I'd use fimo or clay, but then I saw some plasticine in the art store and since it was both much cheaper and less complicated it seemed like a better option. However I may have bought too small a pack - this little statue is only a couple of inches high, so adding any kind of detail was pretty difficult, especially without tools. If I do it again maybe I'll use a pencil or something to draw on whiskers. Still, sometimes simplicity is a good thing, and thinking in three dimensions was a nice change.